CHARLOTTESVILLE, Va. -- Anger boiled over at the first Charlottesville City Council meeting since a white nationalist rally in the city descended into violent chaos, with some residents screaming and cursing at councilors Monday night and calling for their resignations. Hundreds of people packed the council's chambers, CBS Charlottesville affiliate WCAV-TV reported. Many were there very upset about how the August 12 rally was handled and blamed several of the city leaders, the station says. Mayor Mike Signer was interrupted by shouting several times in the first few minutes of the meeting, The Daily Progress reported. As tensions escalated, the meeting was halted. 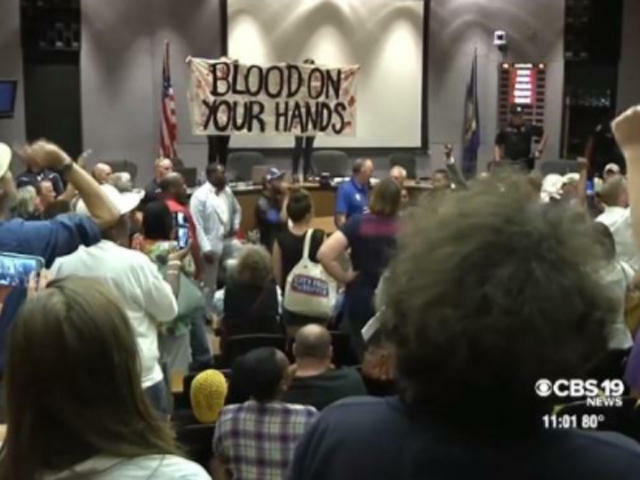 Live video showed protesters standing on a dais with a sign that said, "Blood on your hands." After talking with members of the crowd, Councilor Wes Bellamy said the council would drop its agenda and focus on the crowd's concerns, the newspaper reported. Speakers, some yelling profanities, then took turns addressing the council, some expressing frustration that leaders had granted a permit for the rally. Others criticized the police response to the event, which drew hundreds of white supremacists as well as counter-protesters. The two sides clashed violently in the street that day, largely uninterrupted by authorities, until the event was declared an unlawful assembly and the crowd was forced to disperse. Later, a car rammed into a crowd of counter-protesters, killing a woman and injuring 19 others. The death toll for the day climbed to three when a helicopter that had been monitoring the event and assisting with the governor's motorcade crashed, killing two state troopers. The event, dubbed "Unite the Right," was sparked by the city's decision to remove a statue of Confederate Gen. Robert E. Lee. A police spokesperson said three Charlottesville residents -- ages 29, 30 and 43 -- were arrested and taken into custody after the council meeting Monday night. They were charged with disorderly conduct or obstruction and released on summons. The arrests took place shortly after Mayor Mike Signer warned attendants would be taken into custody if they interrupted the meeting. This added to the public's anger. At one point, the crowd chanted, "Signer must go." Elsewhere in Charlottesville, dozens of students rallied Monday night at the University of Virginia in opposition to the August 12 violence. Video of the event streamed by the newspaper on social media showed students marching on the stately grounds of Virginia's flagship public university. The event was billed as a "reclaim our grounds" rally and organizers said it was held to highlight the advances made at the university to end racism and discrimination in recent decades. The organizers also said via social media that they were seeking to send a message to the university leadership that more advances were still needed. Earlier Monday, the man who authorities say drove his car into the crowd of counter-protesters Aug. 12 made a second court appearance. The Charlottesville Commonwealth's Attorney's Office said James Alex Fields Jr., 20, appeared by video Monday. It was his first hearing on a second set of charges filed against him last week. Senior assistant Commonwealth's Attorney Nina Antony says a judge declined for now to set bond for Fields, who has another hearing Friday. The charges against Fields include second-degree murder. In addition to the death of 32-year-old Heather Heyer, police said, some of the 19 people injured when the crowd was rammed by the car suffered serious and permanent injuries. Fields' attorney couldn't immediately be reached. In developments elsewhere, U.S. House Speaker Paul Ryan said Monday he wouldn't support a resolution to censure President Trump over his comments following the white supremacist march in Virginia. Ryan was asked at a town hall organized in his Wisconsin congressional district whether he would back the resolution. The question came from Rabbi Dena Feingold, the sister of former Democratic Sen. Russ Feingold of Wisconsin, who grew up in the same city as Ryan. "If we descend this issue into some partisan hack-fest, bickering between one another ... what good does that do to unify this country?" Ryan said, adding that it would be the "worst thing we could do." While Ryan said he wouldn't support censuring the president, he gave his sharpest criticism to date of Mr. Trump's comments in the wake of the Charlottesville rally. Ryan had previously spoken out against the violence, both on Twitter and in a statement earlier Monday, but hadn't previously addressed the president's comments directly. "I do believe he messed up on his comments on Tuesday," Ryan said, referring to Mr. Trump asserting there were good people on "both sides" of the Charlottesville rally. "I think he made comments that were much more morally ambiguous, much more confusing." But Ryan added he believes the president has clarified his remarks.